This ongoing research uses a zero-waste manufacturing process to create performative sculptural surfaces. 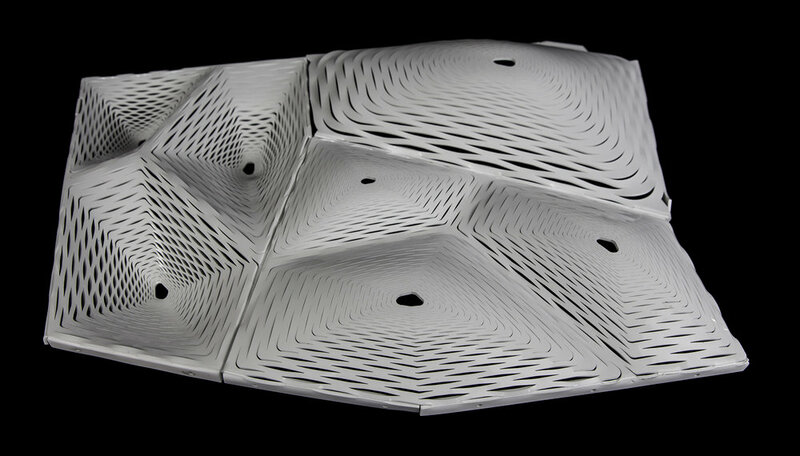 It explores the relationship between 2D pattern and 3D volume, representation and fabrication, structural rigidity and atmospheric permeability, and mass production and customized fabrication. Digital modeling and parametric software make it fairly easy to design complex forms, which often need to be re-engineered for manufacturing, or at the very least translated into a suitable format such as cut sheets or G-code. This research takes a different approach, investigating how two-dimensional drawing and patterning techniques can directly translate to the manufacturing of highly variable volumetric surfaces. 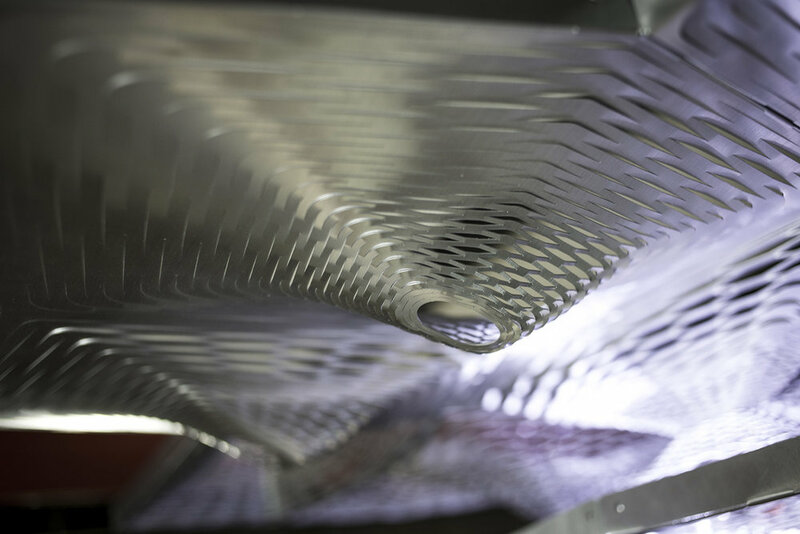 Expanded metal surfaces, which use a pattern of offset slits to produce a rigid and permeable sheet with zero material waste, provides a precedent for this work. Parametric software is used to control a series of 2D geometric variables, which collectively choreograph the intricate reactions that give form and structure to the material. The final form is highly dependent on the amount and direction of force applied to the cut sheet, allowing for a high degree of variability even with standardized parts. This workflow attempts to blur the boundary between representation, fabrication, and customization as acts of design. Tessellation is used at the scale of a single surface and at the scale of a modular assembly, to minimize the perception of panelization and repetition, instead creating an impression of continuity and variation. Parametric software is used to test combinations of panel geometry and subdivision geometry, finding combinations that use rotational and reflectional symmetries to create alignments across panel joints. While panel and subdivision variation is possible, a single standardized component maximizes efficiency of manufacturing. For more work in expanded surfaces, see Cielo.